A day in the sun is fun and relaxing, but it's important to protect your skin and a sun hat with a large brim is a great way to do that! 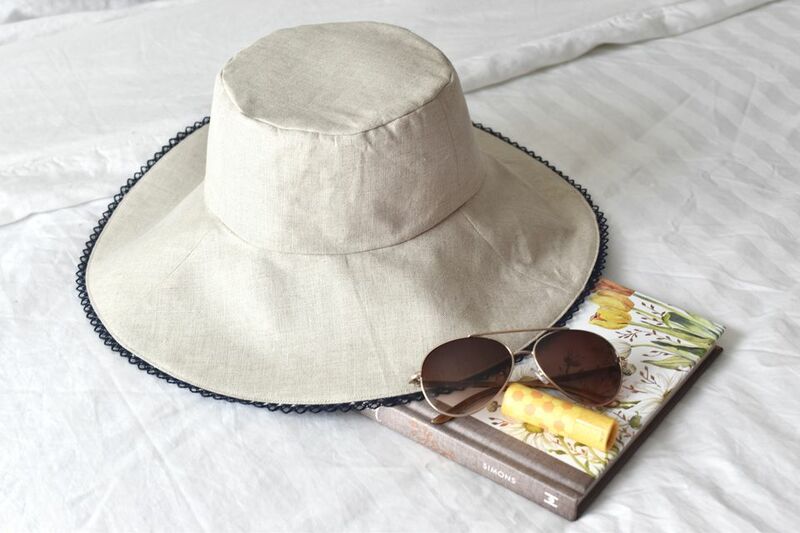 Make your own reversible sun hat with this free easy sewing pattern in two sizes. The style of this hat combines the large, 4-inch brim of a traditional beach hat with a hint of a bucket hat shape. Fusible interfacing gives it a soft structure that's neither too stiff nor too floppy. 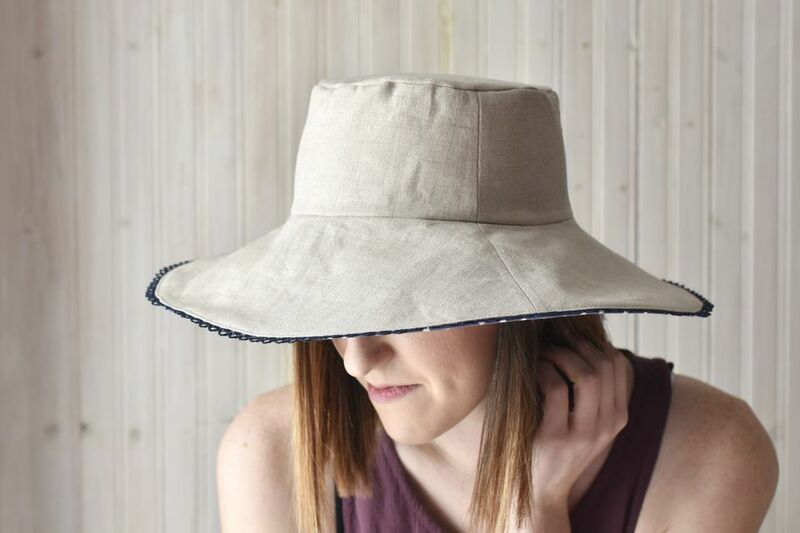 In just a few hours, even beginning sewers can make this easy hat and enjoy a sunny day! Note: The design of this hat is not ideal for directional prints. Download and print out the pieces for the hat size you need. Be sure to print the pattern at 100% and so that the 1-inch gauge measures accurately. S/M measures about 22-1/2" inside. M/L measures about 24-1/4" inside. If you need to alter the inside measurement a little, print the pieces either a few percents larger or smaller, with each of the three pieces printed at the same percentage. Iron fusible interfacing to the back of the linen and the quilting cotton. Follow the manufacturer's instructions for fusing the material. Cut all of the pieces from both the fused linen and cotton. Cut three brim pieces, placed on a fold, with the fold following the grain. Cut three crown pieces, with the words following the grain. Cut one top piece and transfer the three markings around the edge to the interfacing side of the circle. Pin and sew the short edges of the linen brim together, ​back stitching at the ends to lock the seams. Pin and sew the short edges of the crown in the same way. Press all the seams open. Repeat this for the quilting cotton pieces. Turn the sewn crown piece right side out. Place the crown inside the brim with the larger opening touching the center opening of the brim. Match up the seams and pin the pieces (right sides together). Pin the seams first, then divide each section to ease the two pieces together as needed. Sew around the circle with a 1/4-inch seam allowance, removing the pins as you go. Repeat with the cotton pieces. Turn the sew pieces wrong side out. Pin the top piece to the crown, matching the markings to the seams. As before, divide the sections and ease the pieces as needed. Sew around the top of the hat with a 1/4-inch seam allowance, removing the pins as you go. Repeat this and the previous step with the quilting cotton pieces. You now have two matching pieces for the inside and outside. If you want to add trim or piping around the brim of the hat, pin it to the linen hat with the right side facing the fabric and the raw edges matching. Sew around the brim to secure the trim, stitching about 1/8" from the edge and overlapping the ends. Turn the linen hat piece wrong side out and the cotton piece right side out. Nest the two pieces with right sides together so that the seams of one piece are centered on the brim panels of the other piece. The seams should NOT match up, as they would become too bulky. Pin around the brim and mark where the opening should be, placing it near the overlap of trim. This will be the back of the hat. Sew around the brim, backstitching at the beginning and end of a 5-inch opening. Turn the hat right side out and push the crown of the cotton piece into the linen piece. Press the hat brim, opening the seam. Press the open seam allowance under 1/4" so the edge matches and is smooth. Top stitch around the brim, sewing 1/8" from the seam. This closes the opening and gives a nice finish. If you'd like, you can sew additional lines of top stitching, spacing them about 1/4" apart. This is a great detail on hats without a lace trim on the edge. After a quick pressing, wear your new hat in the garden, by the pool, or on a sunny vacation. It's like having two hats in one, and it even folds for packing! Want to add a little more embellishment to your hat? Embroider some flowers, your initial, or a fun sunny phrase on the linen side before sewing the two sides together. Combine several complementary fabrics on one side for a scrappy look. Add a brooch or a bow with a pin back so it's easily removable.